What's for dinner? : Daily displays of food options in the Connection Café are among improvements made to dining services based on student feedback to the Food Services Task Force Committee. A wider variety of dining choices and payment options are available for students grabbing a bite on campus. The changes are a direct result of feedback from student surveys collected last semester and recommendations from the Food Services Task Force Committee, comprised of students, administrators, and representatives from Aramark, which manages dining services on campus. 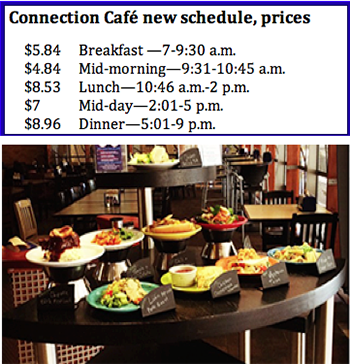 Mid-morning and mid-day pricing has been added at the Connection Café. Mid-morning meals are 9:31-10:45 a.m. at $4.84, $1 less than the breakfast price. Mid-day meals are 2-5 p.m. at $7, which is $1.53 less than the lunch price and $1.96 less than dinner. Savings are even more when using a meal plan. An all-day dining pass for $12.50 is good for three meals per day at the Connection Café. Purchase the pass through Friday, Feb. 13, and use the pass any time during the semester. A board with menu items and their nutritional and allergen information is at the entrance to the Connection Café. At the POD Market, more hot food options are available, including five items under $5. “The work of the task force isn't over,” says Tim Quinnan, vice president for student affairs. “Now we have to generate ideas on the future of campus dining facilities from the student's point of view and preference." Other issues being researched by the task force include weekend hours, food service in residence halls, and meal plan improvements. Posters about the improvements are in campus dining locations and on digital screens in residence halls. Aramark also welcomes feedback from your campus dining experience. Visit campusdiningvoice.com to let Aramark know how it is doing. You can follow Dining Services on Instagram. The Office of Sustainability rolls out a new car-sharing program Wednesday, Feb. 4, as part of its commitment to creating a more sustainable campus for students, faculty, and staff. Zipcar, the world's leading car-sharing network, is open to those over 18 years of age and who have been licensed for at least one year. Students, faculty, or staff may join the membership program for $25, then pay $7.50 per hour or $69 a day to reserve one of four vehicles parked on campus. The cost includes gas, insurance, 24-hour roadside assistance, wireless technology, and other features. Zipcar replaces the Hertz car-sharing program. Visit zipcar.com/uta for more information. Read more about the car-sharing program. A few standby tickets will be available at the box office to see theoretical physicist Michio Kaku on the night of the show only. All tickets have been claimed for the Maverick Speakers Series event at 7:30 p.m. Thursday, Feb. 19, in Texas Hall. Standby ticket holders will be seated, space permitting, 10 minutes before the show starts. Accommodation is anticipated but not guaranteed. Lynne Waters, associate vice president for external affairs and university relations for the University of Hawai’i System, has been named vice president for University Communications. Her first day will be Feb. 27. Waters, a native Texan, is a former television news anchor and reporter who owned a comprehensive communications consulting firm. She has directed strategic communications planning, community relations, creative services and marketing, and brand management for the UH System, including its 10 campuses and some 59,000 students. At UT Arlington, Waters will work closely with President Vistasp Karbhari and the senior leadership team to direct the University’s global marketing and communications efforts, institutional marketing and brand positioning, internal communications, media relations, and community relations initiatives. Read more about Waters' appointment. A recent phone scam involves the caller claiming to be a police officer collecting debts, according to the UT Arlington Police Department. The caller tells people they owe money for unpaid "Homeland Security" taxes and other debts. He threatens the individual with arrest and solicits immediate payment for the alleged debts. The telephone number used has been cloned from a legitimate agency. The scam is similar to one used last fall claiming to be a UTA official collecting unpaid tuition and other school debts. 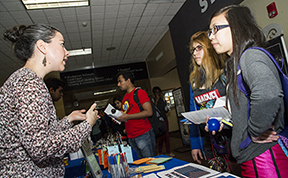 Cindy Manzano, outreach coordinator for Counseling and Psychological Services, shares program details with Mila Nguyen, nursing freshman, and Lissette Barraza, aerospace engineering freshman, at the spring Activity Fair. Last Wednesday's fair, which promotes campus programs and organizations, was at the Palo Duro Lounge of the E.H. Hereford University Center. Meet your Student Congress senators and share tasty desserts and friendly conversation starting at 6 p.m. today, Tuesday, Feb. 3, in the Palo Duro Lounge of the E.H. Hereford University Center. The next monthly test of the MavAlert Emergency Notification System is at 12:30 p.m. Wednesday, Feb. 4. Faculty, staff, and students should update their personal contact information through MyMav. You must enter a mobile phone number in your online MyMav record and label it "Mobile" to enable MavAlert emergency notifications via text message. Martin McZeal, communication junior, lands a ringer in yard pong on The Green at College Park. 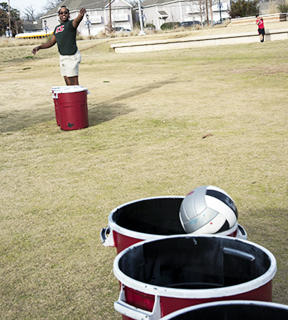 The game was part of tailgating event before last Thursday's women's and men's basketball games against Georgia State. Residence halls are fully furnished and all-utilities paid, including electricity, water, unlimited laundry, Wi-Fi and Ethernet connection, and cable TV. Click here to find the rates and amenities of UTA's six unique on-campus residence halls. Preparation work for new landscaping and lighting are in the works on the mall from the Central Library to West Street. The improvements follow the replacement of a collapsed sewer line. 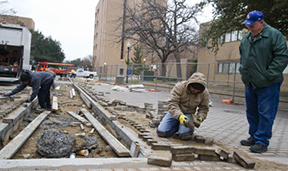 Hector Contreras, center, adds new pavers outside the Chemistry and Physics Building while Don Madison, construction coordinator, looks on. Employees — Employee Assistance Program (EAP) is provided through UT Arlington’s Office of Human Resources at 1-800-343-3822 or visit alliancewp.com. Students — Drug and alcohol counseling and referral services are available through UT Arlington Health Services at 817-272-2771 or visit uta.edu/healthservices. 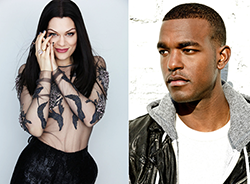 Grammy nominees Jessie J and Luke James will perform for the Spring Concert at 8 p.m. Tuesday, Feb. 10, at Texas Hall, two days after the prestigious music awards ceremony. Jessie J was nominated for Best Pop Duo/Group Performance for Bang, Bang with Ariana Grande and Nicki Minaj. She also will perform with Tom Jones (It's Not Unusual, What's New Pussycat?) for the awards ceremony, televised at 7 p.m. Sunday, Feb. 8, on CBS. She was nominated for two 2015 People’s Choice Awards—Favorite Pop Artist and Favorite Song (Bang, Bang). In 2012, her Price Tag won the MTV Video Play Award for highest video play counts on all MTV channels. James is up for Best R&B Song for Options (Wolfjames Version) with Rick Ross. He is a singer/songwriter who truly embodies the honesty and fresh, organic soulfulness that’s been in relatively short supply of late. The New Orleans native has penned songs for Justin Bieber (That Should Be Me) and Britney Spears (Kill the Lights). Tickets are $15 with student ID, $20 faculty and staff, $25 general admission. EXCEL Campus Activities sponsors the event. Bassoon Week Recitals Bassoon students perform. Free. 7:30 p.m., Irons Recital Hall, Fine Arts Building. Also, Thursday, Feb. 5, and Saturday, Feb. 7. Music. UT Arlington Wind Symphony Concert Conductor Douglas Stotter leads a concert of band classics from around the world. Tickets $6 with student ID, seniors; $9 adults. 7:30 p.m., Irons Recital Hall, Fine Arts Building. Music. Flight 12 Improv! An evening of funny and oh-no-you-didn't moments presented by 12 members of the Maverick Theatre Company. Free. 8 p.m., Studio Theatre, Fine Arts Building. Also, Saturday, Feb. 7. Theatre Arts. Men's Basketball on ESPN Mavericks vs. Louisiana-Lafayette game televised from the Cajundome in Lafayette, La. 1 p.m., ESPN2. Athletics. A Quick Look at Engineering Student and Faculty Achievements Two examples of achievements by student teams and faculty members: an award-winning real-time monitoring system that enables better vehicular flow and a project to solve water-related challenges some cities face due to urban population growth and climate fluctuations. Light breakfast provided. RSVP. Free. 7-8 a.m., Room 100, Nedderman Hall. Arlington Technology Association. Women Go Red Learn about heart disease and how it affects women. 10 a.m.-2 p.m., Palo Duro Lounge, E.H. Hereford University Center. Health Services. The New Black: Examining Racial Identity from a Contemporary Perspective Jason Shelton, associate professor of sociology, and Danté Bryant, social work doctoral student, detail racial identity from a contemporary perspective. Free. Noon-1 p.m., Carlisle Suite, E.H. Hereford University Center. Center for African American Studies. Mighty Mavs: Freshman Rebekah Van Dijk, top, recorded her 10th double-double with 19 points and 12 rebounds in Saturday's 70-67 victory over Troy. Middle, junior infielder Darien McLemore was named a member of the 2015 Preseason All-Sun Belt Baseball Team. Bottom, freshman Daniel Velasquez was named to the USA National Junior Team and invited to compete at the International Wheelchair and Amputee Sports Federation World Games on July 2-8. Velasquez, who has cerebral palsy, also will represent UT Arlington at the World Games. The women’s basketball team shot a season-best 52.1 percent to defeat Troy 70-67 Saturday at College Park Center. Freshman Rebekah Van Dijk recorded her 10th double-double with 19 points and 12 rebounds. UTA downed Georgia State 57-45 Thursday to reach 10 victories for the first time since the 2009-10 season. Van Dijk led the way with a game-high 16 points. The Mavericks are 11-9 overall and 5-6 in the Sun Belt Conference. They face Louisiana-Lafayette on the road Saturday, Feb. 7. The Mavericks failed to hold a second-half lead for the second consecutive game, falling to Troy 55-54 Saturday night at College Park Center. Senior Greg Gainey came off the bench to score 15 points. UTA lost 88-74 Thursday to Georgia State despite holding an 11-point lead in the second half. Freshman Kevin Hervey scored a season-high 21 points. The Mavericks are 12-9 on the season and 6-5 in conference play. Next up is a road game at Louisiana-Lafayette on Saturday, Feb. 7. Catch the action on ESPN2 beginning at 1 p.m. The men and women’s track teams turned in some outstanding individual performances Saturday afternoon at Nebraska’s Adidas Classic. For the men, Quentin Butler won the 200 meters and the long jump, while Tobi Fawehinmi placed first in the triple jump. In women’s action, Ashley Wright won the 800 meters, and Katelyn Howard was first in the mile. The Mavericks return to action Saturday, Feb. 14, at Wichita State’s Varsity Apartments Invitational. It’s the final event prior to the Sun Belt Conference Indoor Championships Monday-Tuesday, Feb. 23-24, in Birmingham, Ala. The men and women's tennis teams defeated Midwestern State University on Friday afternoon at the UTA Tennis Center. The women came up with another 7-0 sweep, while the men regained momentum winning 5-2. The men face Rice in Houston on Friday, Feb. 6. The women are home Saturday, Feb. 7, for a doubleheader against Dallas Baptist and Seminole State. UT Arlington was picked to finish fourth in the Sun Belt Conference Preseason Coaches' Poll. The Mavericks also had junior infielder Darien McLemore honored as a member of the 2015 Preseason All-Sun Belt Baseball Team. The Mavericks open the 2015 season Friday, Feb. 13, when they travel to Nacogdoches to face Missouri State in the Stephen F. Austin Tournament. UT Arlington's home opener is Friday, Feb. 20, when it hosts Southeastern Louisiana in the UTA Hilton Invitational. Season tickets are $75 for the 24-game baseball schedule at Clay Gould Ballpark. The schedule includes all 15 Sun Belt Conference home games and one tournament. All seating is general admission. Season tickets do not include UTA's home game at Globe Life Park in Arlington on Tuesday, March 17, against Texas. Information on tickets for the Mavericks' matchup with the Longhorns will be released at a later date. Season and single-game tickets are available at utatickets.com or by calling 817-272-9595. The UT Arlington softball team was picked to finish eighth in the team's second season in the Sun Belt Conference as released by the league's 2015 Preseason Poll voted on by the SBC coaches. UTA begins its season Friday, Feb. 6, at the Tangi Tourism Lion Classic in Hammond, La. The Mavericks will open the newly reconstructed Allan Saxe Field on Thursday, Feb. 12, to begin the Maverick Invitational when they host Incarnate Word, Buffalo, Ohio State, and Sam Houston State. Next are games against Texas Tech and Missouri-Kansas City in the UT Arlington Invitational beginning Friday, Feb. 20. Upcoming entry deadlines for intramural sports include pre-season basketball, Tuesday, Feb. 3; basketball, Wednesday, Feb. 4; rock climbing, Tuesday, Feb. 10; and racquetball, Friday, Feb. 13.